Humax's LD2060 Fuses LCD Screen To DirecTV Decoder Box | OhGizmo! By David Ponce on 09/12/06 • Leave a comment! Like it or not, the Holidays are coming. For this reason, in the next few weeks we’re going to slowly shift our focus away from products you point a finger at and snicker, and more towards consumer electronics you can actually purchase and wouldn’t mind unwrapping in polite company. 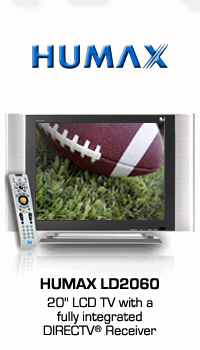 And we think one good such candidate is the LD2060 from Humax USA, which claims to be the world’s first 20″ LCD TV with an integrated DirecTV tuner. That’s right, no separate decoder box or unsightly cables for you to hide somewhere. It’s got a 500:1 contrast ratio and isn’t particularly bulky at 24.2? x 16.3? x 7.1? and 19lbs. You can buy it now from various retailers for as little as $575.